The top of Meetinghouse Hill has been home to Dorchester’s first parish since the earliest days of the colonial settlement of the town in the 1630s. It’s also the location of the first public school in the nation, the Mather Elementary, named for one of the Puritan mainstay families. 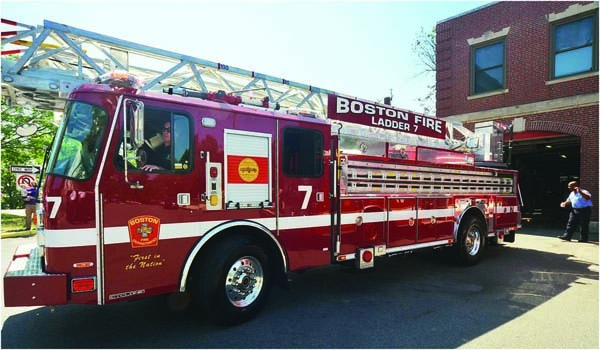 Meetinghouse Hill is also home to another critical institution: the Boston Fire Department, which has maintained a firehouse on the hilltop for most of the last century. Last year, the Walsh administration budgeted $13 million to construct a new station on Parish Street – and it’s sorely needed to support one of the busiest fire companies in the city. The Meetinghouse Hill fire station is centrally located, but the way the building is situated on Parish Street— facing the front door of the Mather School and the historic church— is not ideal. Finn is in talks with the First Parish Church leadership to consider an option to build the new firehouse closer to the intersection with Winter Street— facing out onto Rev. Allen Park. The location is now a vacant lot owned by the church. The site was once home to Lyceum Hall, which was the center of civic life in the old town of Dorchester for a century— from the 1850s until it was, unfortunately, demolished in the 1950s. “We are talking with First Parish for the land that abuts the firehouse property and getting it appraised,” Commissioner Finn told the Reporter this week. The appraisal, he said, would include a geological study to see if the site is feasible for a new firehouse, since there is a large Puddingstone formation on the hilltop. “Either way it’s going to be built up there. The current house is well beyond its years in terms of its usefulness. But it would certainly more attractive to move it down to the corner,” said Finn, who added that church leaders have been very helpful in working with the fire department to consider the idea.